Diablo 3 RMAH fact and speculation after the jump! Having passed series 6 and series 63 the Commonwealth of Massachusetts says that I can sell people investments in mutual funds. However, over the past 6 months I’ve learned that working on comission is not for me. So I’m looking to work for New York Life Investment Management in Customer Service. Fortunately that job requires series 6 and series 63 licensing. My future and the future of this blog is unknown. At this point it’s a waiting game until NYLIM goes through the interview process. Until then I have a few clients that need some financial goods and services to tide me over. From a game design point of view, a small Ma game development company likes one of my game concepts, and wants to work on it. This is a loose deal, but means actually making a real game prototype with someone who knows what they’re doing. I expect no profit from this, but look forward to starting a real game and giving it a go. (Well another go). So in the past year I’ve started two businesses, and two businesses have failed. This is encouraging. At this rate I’ll be a successful entrepreneur in 2 years (or 4 more failed businesses, which ever one comes first)! What better way to celebrate then with some speculating in Digital Goods! Maybe D3 can be business #3. That brings me to Diablo III! The real money auction house went live yesterday, and I jumped right in. 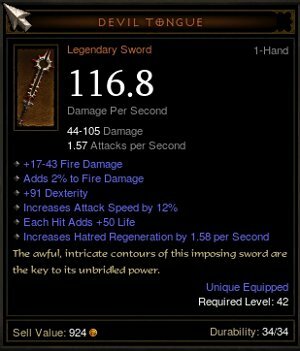 Having been fortunate enough to find a legendary item, Devil Tongue, there was something worthwhile to sell. Here is my particular version of the Legendary. Mine is the highest DPS Devil Tongue in the auction house (116.8 DPS $60 min $75 Buyout)! Which is rather lucky. You can see that others have lower DPS but have buyout prices as high as $200 (they were there first). It was tempting to price it as such. That would be a nice payout, but my pricing strategy was to severely undercut those prices, to make my auction more liquid than the others. On the first day a lot of people are asking for a lot of money… But it hasn’t sold yet. So we have no confirmation that people are willing to pay that much money. We don’t yet know what the market is willing to bear. Secondly I paid $60 for the game. My realistic goal is to pay for the purchase of the game. So I am happy with anything over $60. Besides I have a second legendary item ready if this one sells! So no reason to be greedy. I plan on putting every legendary found up on the RMAH, and everything else on the gold AH. So far searching the Gold AH for more items to sell has not yielded any results, but at the end of Day 1, it’s too soon to really tell. /r/diablo has comments stating they are willing to pay real money now for good gear. It would be great to see some proof of this. However, that list hasn’t really moved much. There has not been a lot of churn… Which most likely means a flat market (few buyers). If this is the case, items may need to be re-posted for a while until buyers get the cash together to step up. 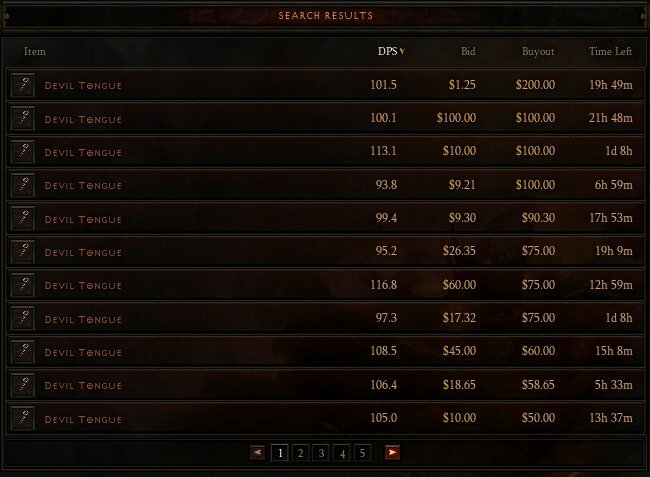 The Diablo RMAH or Gold AH will in the end function like the WOW economy, while resources are scarce (before people play for 12 months) goods will fetch the highest prices. Ultimately the value of digital goods is a function of the number of people mining and the number of people willing to buy. Right now $200 bucks for a level 42 sword is most likely not in the realm of possibility for the average player. It would be super hard for the Diablo 3 player base to increase over time. It would be even harder to convince the player base to pay more for digital goods. Therefore now is the best time to be asking high prices for things. There will never be a better time then today (the day after it opens) on the D3 AH (of any kind). The WOW AH taught us that digital goods always get cheaper over time, until there is a change in value based on game updates. In this respect game updates are like earnings expectations in the real world. You have to pay attention to them. Even though they are dense, and technical and hard to figure out how they change things. There may be other factors as well. For example, people may not have saved enough money yet to want to buy stuff in game. They may be trying to sell smaller items and save up to buy larger ones. Maybe the market needs to grow a little before buyers step up? So what do you think of my strategy? Was it foolish to ask for so little? Was it foolish to ask for so much? (It was. Click the link for day 2 of my RMAH experiment) Should I get my series 7 and then reevaluate these as speculative stocks?